VON ORMY- On May 21, officials from Von Omy, Bexar County, U.S. Silica Holdings, Inc., and BNSF celebrated the grand opening of a new facility that will store and distribute sand used in the hydraulic fracturing (fracking) process in the South Texas energy fields. 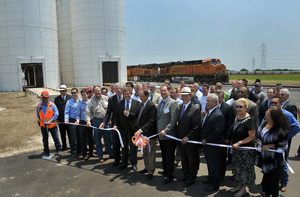 The new facility site, located in the 280-acre BNSF Logistics Center San Antonio in Von Ormy, contains a two-mile rail loop. BNSF will deliver 100-car unit trains carrying 10,000 tons of sand every two days for unloading. "Business is steadily increasing in the Eagle Ford Shale, and we are excited about the possibilities this partnership brings for future growth," said Dave Garin, group vice president, Industrial Products. "We are pleased to offer U.S. Silica a unit-train solution that provides them with the consistency and service to meet their growing demand." The U.S. Silica facility has four loading docks for trucks to take the sand to drilling sites. Up to 80 trucks a day can be accommodated, said Jason Tedrow, U.S. Silica supply chain vice president. US Silica is the second largest domestic producer of commercial silica, a specialized mineral that is a critical input into the oil and gas proppants end market and various industrial and specialty products. BNSF Railway is one of North America's leading freight transportation companies operating on 32,000 route miles of track in 28 states and two Canadian provinces. US Silica anticipates the company will make three to four shipments per month of approximately 10,000 tons of frac sand on 100 car unit BNSF trains from its Ottawa, IL sand mine to meet the industry’s need for proppant. The shipments will include three different grades of dry sand, as well as resin coated proppants from US Silica’s new facility in Rochelle, IL, which is expected to be fully operational in the first quarter of 2013. BNSF acquired the rights to use Union Pacific rail lines under the terms of the Union Pacific merger with Missouri Pacific in 1980, though a lawsuit by Southern Pacific Railroad delayed the operational merger until 1997. Federal law requires that at least two railroad companies have rights to utilize any given major rail corridor in order to prevent the development of rail monopolies.